Prasiolite, green-quartz or vermarine is a green form of quartz, a silicate mineral chemically silicon dioxide. Prasiolite is one of several quartz varieties. Since 1950, almost all natural prasiolite has come from a small Brazilian mine, but it is also seen in Lower Silesia in Poland. Naturally occurring prasiolite is also found in the Thunder Bay area of Canada. Prasiolite can also be found spelled praziolite. Prasiolite can be confused with the similarly colored praseolite which results from the heat treatment of iolite, a variety of cordierite. It is a rare stone in nature. Most prasiolite sold is used in jewellery settings. Prasiolite is heat treated amethyst] Most amethyst will turn yellow or orange when heated producing citrine. But some amethyst will turn green when treated. Currently most all prasiolite on the market results from a combination of heat treatment and cobalt-60 or E-beam Gamma irradiation. Green quartz is sometimes incorrectly called green amethyst, which is an actual misnomer and not an acceptable name for the material, the proper terminology being Prasiolite. 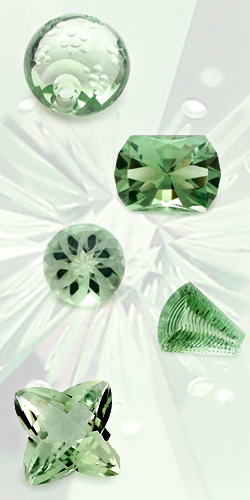 Other names for green quartz are vermarine, greened amethyst, or lime citrine.